I sometimes feel funny posting recipes like this because they're so simple, however we had guests last night for dinner and I served this, and it was a hit, and that reminded me that dishes don't have to be fancy or full of expensive ingredients to be delicious. In fact, sometimes the simplest ones are the tastiest ones. This recipe is both vegan and paleo as well as allergy friendly. And did I mention it was very easy to make? Since I was gifted both the cabbage and the fennel bulbs, this dish was nearly free, but even if you weren't gifted them, being cold weather crops they are a very cheap dish to make. 1. Cut your cabbage into wedges, 2-2.5 inches widest at most. Cut your fennel bulbs in quarters lengthwise. 2. Mix up equal parts oil and mustard, then add sweetener to taste. 3. Add salt, garlic powder, herbs, and spices to taste. 4. 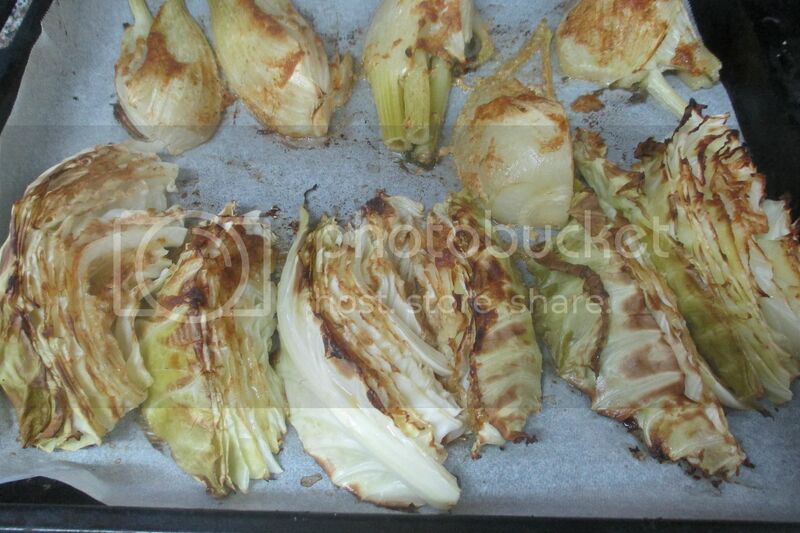 Lay your vegetable wedges onto a lined baking tray, and brush both exposed side with your mixture. 5. Bake uncovered at 350 for 30-40 minutes, or until the wedges are fully soft and starting to brown. What is your favorite easy vegetable recipe, ideally one that tastes delicious and is cheap? Ever made honey mustard cabbage or fennel? Does this look like a recipe you'd try? This looks really yumm! and easy! My easiest go-to vegetable is Roasted Broccoli or Cauliflower. Thaw a bag of frozen broccoli florets or cauliflower florets. Or you can use raw and microwave for a few minutes so they are soft. Put in a ziploc bag or large bowl and add some olive oil and your favorite seasoning. I have used Old Bay Seasoning. Or I just used Trader Joes Chicken Rub. Or Garlic, Rosemary, Salt and Paprika. Toss until covered. Lay out on a parchment paper covered cookie sheet. Bake 375 for about 30 minutes. cut a whole cabbbage into wedges, lay out on a lined baking sheet. I go even simpler.... cabbage, radishes, sweet potato cubed, purple potato cubed, and when I'm flipping at the 1/2 way cook point, I add some asparagus. I coat everything in olive oil w/garlic and sprinkle parmesan cheese on it. YUM. Thanks for showing me the images of fennel. I honestly didn't know which part of the plant to eat and have avoided it because of lack of knowledge. Now I can finally get some. I would never have thought of doing cabbage wedges, it looks super easy and delicious, will definitely try this the next time we have cabbage . Many thanks for the recipe and your inspirational blog !